Design-based research (DBR) is used to study learning in environments that are designed and systematically changed by the researcher. DBR is not a fixed “cookbook” method; it is a collection of approaches that involve a commitment to studying activity in naturalistic settings, many of which are designed and systematically changed by the researcher, with the goal of advancing theory at the same time directly impacting practice. The goal of DBR (sometimes also referred to as design experiments) is to use the close study of learning as it unfolds within a naturalistic context that contains theoretically inspired innovations, usually that have passed through multiple iterations, to then develop new theories, artifacts, and practices that can be generalized to other schools and classrooms. 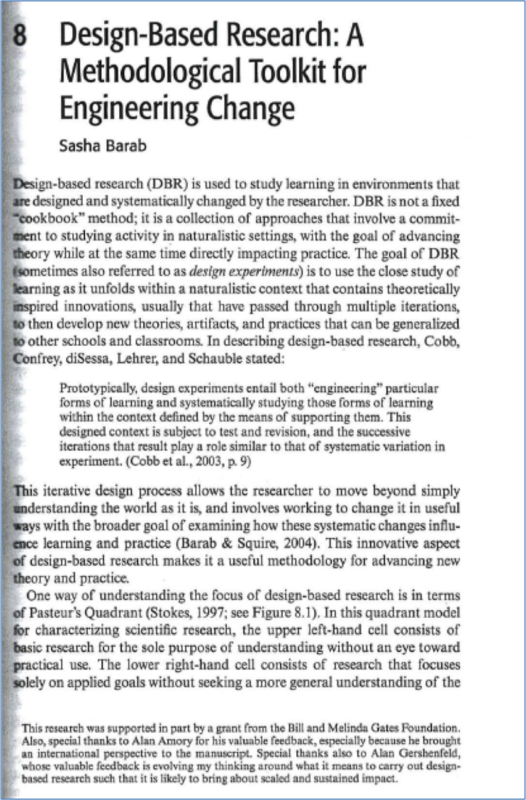 Design-based research involves more than simply reporting outcomes: DBR moves beyond descriptive accounts to offer what Gee (2013) refers to as “storied truths” from which others can gain process insights that usefully inform their work. Storied truths, while bound to a particular context, are based on a level of reflexive thinking in relation to grounded warrants (Toulmin, 1969; also see Andriessen & Baker, this volume) that shift the underlying claim from personal sentiment or informed opinion to a warranted argument that is meaningfully tied to the world. Such sharing involves methodological precision and rich accounts so that others can judge the value of the contribution, as well as make connections to their own contexts of innovation. A well presented and carefully conducted design narrative has the potential to support what Stake (1995) referred to as “petite generalizations;” that is, work that provides others insights into the challenges and opportunities that might emerge in their own work, as well as strategies for navigating these effectively. A key argument in favor of DBR is that demonstrating value in context should be a key component of the theory validation process undertaken by empirical researchers. Experimental studies can certainly be used to validate theories, but simply demonstrating a variable is significant, while useful as part of the validating story, may be less useful than are rich examples and case narratives for informing how to implement a particular variable or theory within the context of real-world practice. Within learning environments, so called “confounding variables” necessarily occur and must be taken into account (not controlled) if the findings are to be relevant to practitioners (also see Greeno & Engestrom, this volume). Context is not simply a container within which the disembodied “regularities” under study occur, but is an integral part of the complex causal mechanisms that give rise to the phenomenon under study (Maxwell, 2004). Barab, S. A. (2014). Design-based research: a methodological toolkit for engineering change. In K. Sawyer (ed.) Handbook of the Learning Sciences, Vol 2, (pp. 233-270), Cambridge, MA: Cambridge University Press.